Before you commit to any kind of smoothing or straightening treatment, it is a good idea to know the difference between the two. An experienced stylist can offer a consultation in helping you achieve your desired results. The Brazilian Blowout is actually a registered trademark brand name that is often referred to as describing the actual professional smoothing service. This can be confusing as many salons use other smoothing products other than the original Brazilian Blowout. So, first, and foremost, consult with a reputable stylist before scheduling one of these treatments. A keratin treatment will create a straighter, sleeker appearance, and calm unruly hair. These treatments make the hair much easier to manage by reducing the volume, making them the best option for over curly and over voluminous hair. Frizz will be removed from your hair up to 3 months after the service. If you currently have straight, fine, or thin hair, a keratin treatment is not recommended as it would further reduce the volume of the hair. A Brazilian Blowout makes the hair more manageable and frizz-free, but, also keeping the volume and movement in the hair. This treatment works the best with some slight waves or curls, or fine to medium texture hair. Also, if you have previously had a keratin treatment, Japanese straightening treatment, or relaxer, a Brazilian Blowout can be applied. After the treatment, the curly hair will be much softer and easier to control, especially when blow drying or using straightening irons. Both treatments can be tailored to suit each individual’s desired results by adjusting the level of heat or amount of product applied. Also, they both reduce blow drying time, seal in color, add shine, and remove frizz. However, the Brazilian Blowout is the most flexible and convenient, as the results are almost instant and complete when you leave the salon. 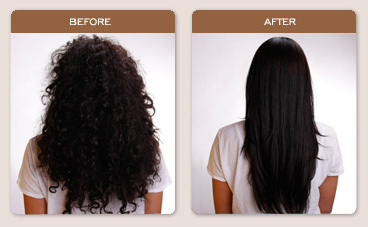 Also, a brazilian blowout takes about 1-2 hours in the salon, whereas a keratin treatment may take about 3 hours. The keratin treatments need to be left in the hair, and rinsed after three days. You also need to refrain from tucking your hair, tying hair back, or sweating to prevent any kinks that could develop in the hair. Hair is prepared by using a clarifying shampoo, towel dried, and blow-dried completely.The treatment is then applied evenly, section by section, and then processed for 20-30 minutes with a cap. This allows deep penetration of the product into the hair shaft. The hair is dried completely again with blow dryer, and flat ironed at 450 degrees. Once flat ironed, you will leave the product on the hair for three days, washing it out at home. Flat ironing is the bonding process, which bonds protein to the outer layer of the hair. This helps protect, smooth, soften, and relax the hair. Hair is prepared by using a clarifying shampoo, and towel dried lightly. Product is then applied section by section, evenly, and blow dried. Once completely dry, hair is flat ironed at 450 degrees. Then, hair is rinsed to make sure all product is removed, and a deep conditioner is applied. Finally, hair is blow dried for the finished result.